Get Revved Up between now and the 26 December 2015 and stand a chance to win your share of R 3 million in cars, cash and FreePlay! Visit Silverstar Casino - the West Rand’s number one entertainment destination and simply play slots or tables to accumulate sufficient points for conversion into tickets to take part. Be sure to be at Silverstar every Wednesday evening to participate in the cash draws. 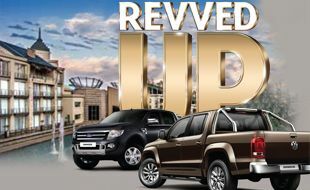 You could also drive away in either a brand new Ford Ranger or VW Amarok through the car draws taking place on the 28 November 2015 and 26 December 2015. Plus, by playing any slot machine in the main non-smoking casino, you could be one of the daily winners who score instant FreePlay prizes. Silverstar Casino guests will undoubtedly be Revved Up at the prospect of winning these amazing prizes! Play Slots or Tables from 1 October to 26 December 2015 with your membership card to earn tickets to Wednesday cash Draws and Car Draws. Cash draws will take place on Wednesday evenings, 19h00 for Platinum and Gold and 20h00 for Black Cardholders. Car draws will take place once a month in November and December, dates and car prizes stipulated below, where one lucky winner will drive away in a brand new car. Celebration Time will run from 9 October to 26 December 2015 every Friday and Saturday between 19h00 and 22h00 and 14h00 to 17h00 on Sundays. Play with your membership card on any Slot machine on the Main non-smoking casino and you stand a chance of winning instant FreePlay prizes, instantly loaded on to your membership card.